I don’t know if it’s a second child thing or Annie is just a complete adventurer but she is a magnet to danger! 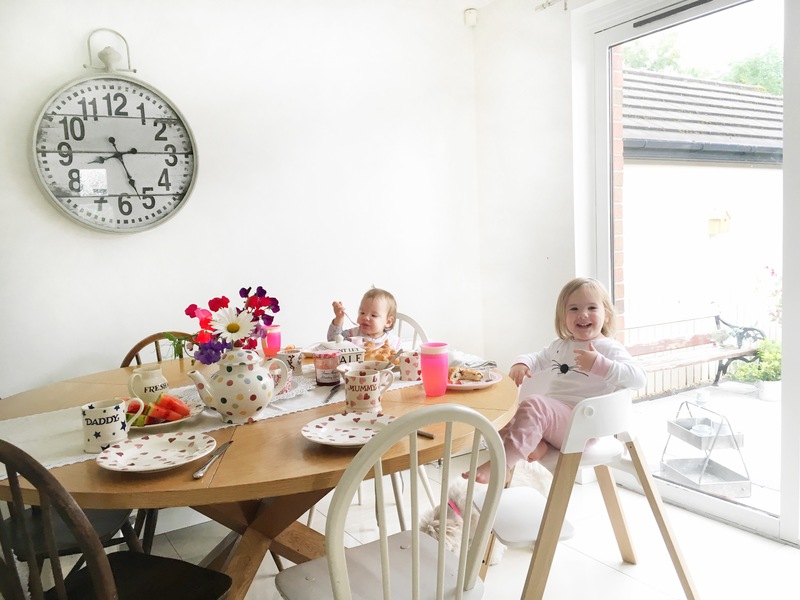 Annie can work her way out of most highchairs, I actually don’t know how as everytime she is strapped in but recently I walked into the utility room for 2 minutes and came out with her about to literally jump out of a highchair! 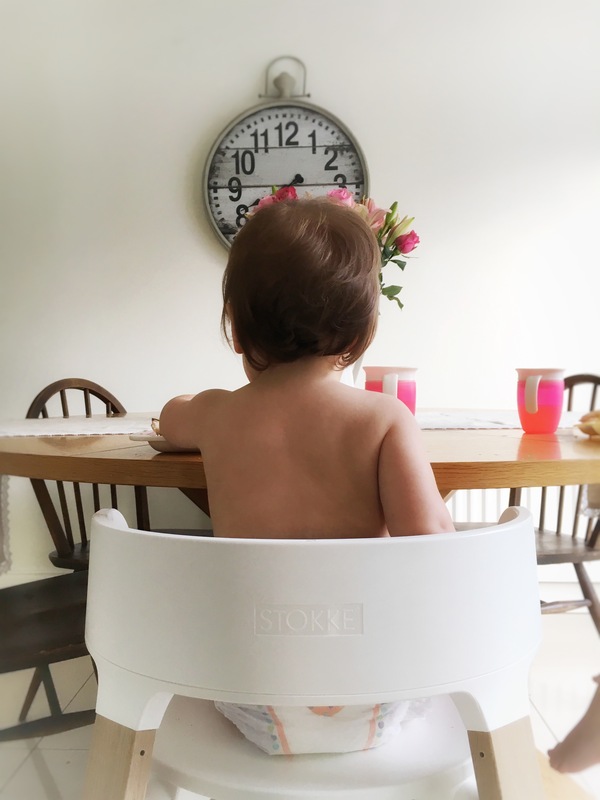 I had the perfect opportunity then to try the Stokke steps and jumped at the chance. I love the brand and the Scandinavian, simple and modern design. Yes I know the number 1 priority is child safety but it is definitely a bonus if baby products can complement the decor of your house too. 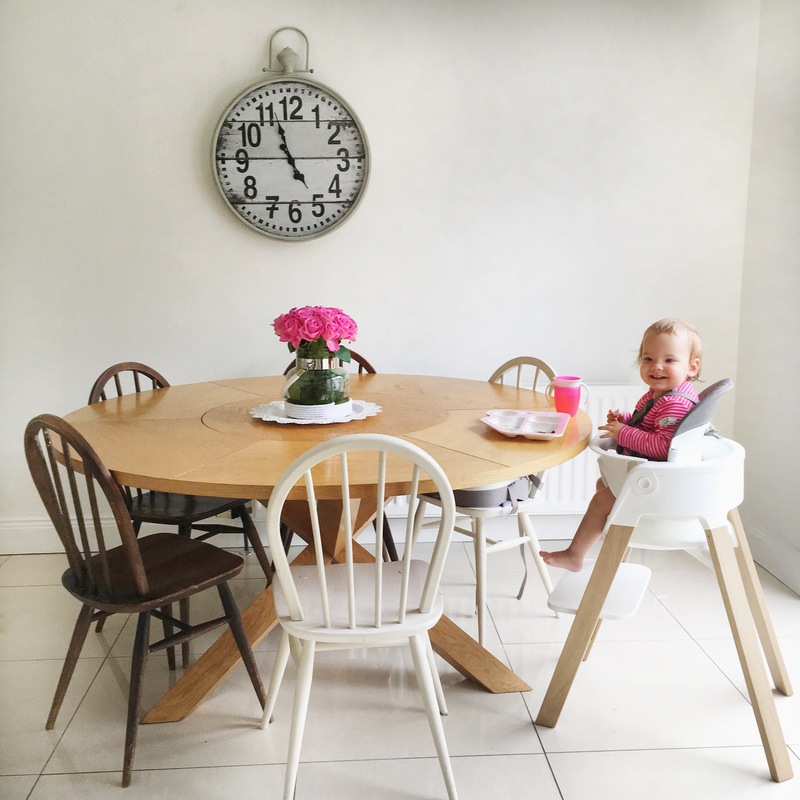 The Stokke Steps can hold the bouncer seat for the newborn days and has a cradling action that mimics the mothers arms so that your little one can join you at the table, whilst being slightly rocked (perfect for getting to eat your dinner HOT) then you can add a child seat and tray for when they begin to explore food. 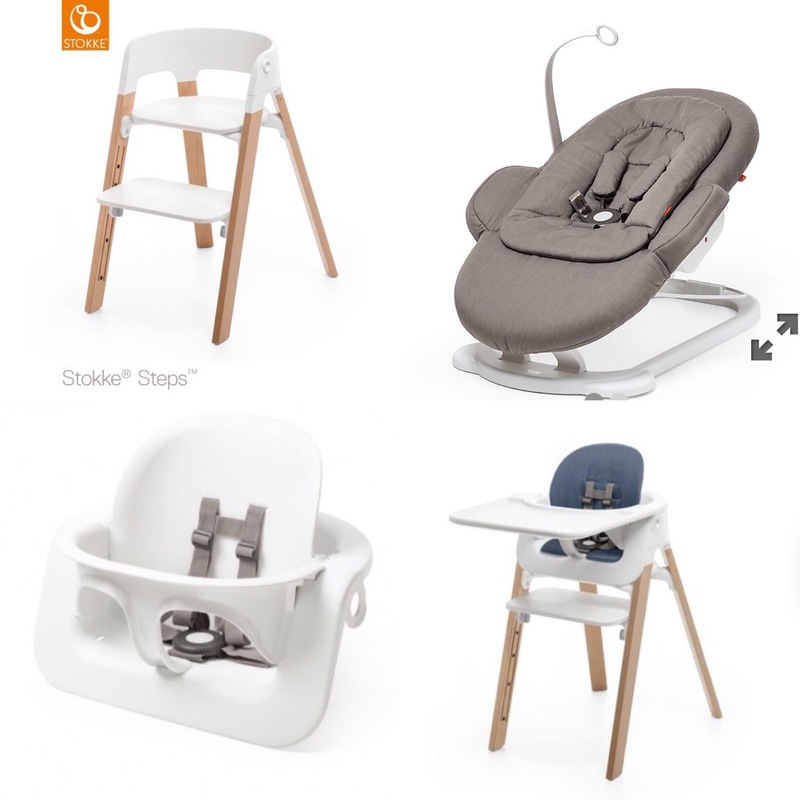 The baby seat is added in one simple click and we would regularly take the baby seat on and off to turn the Stokke Steps into a chair. I have been lucky to be able to try this chair out with both Bella and Annie and they both love it. I regularly pop the baby seat on and off depending on who is using it that day. The chair would be at the higher price end (prices start at £169) but I honestly believe this is worth it especially if using from the baby is newborn or just beginning to wean, I can confidently say that this seat will be sitting at our table for the next 5 years and with the sleek style we won’t be in any rush to remove it. Stokke steps will match any modern interior as you can design it to fit perfectly with your home, from the wood to the textile colour range. 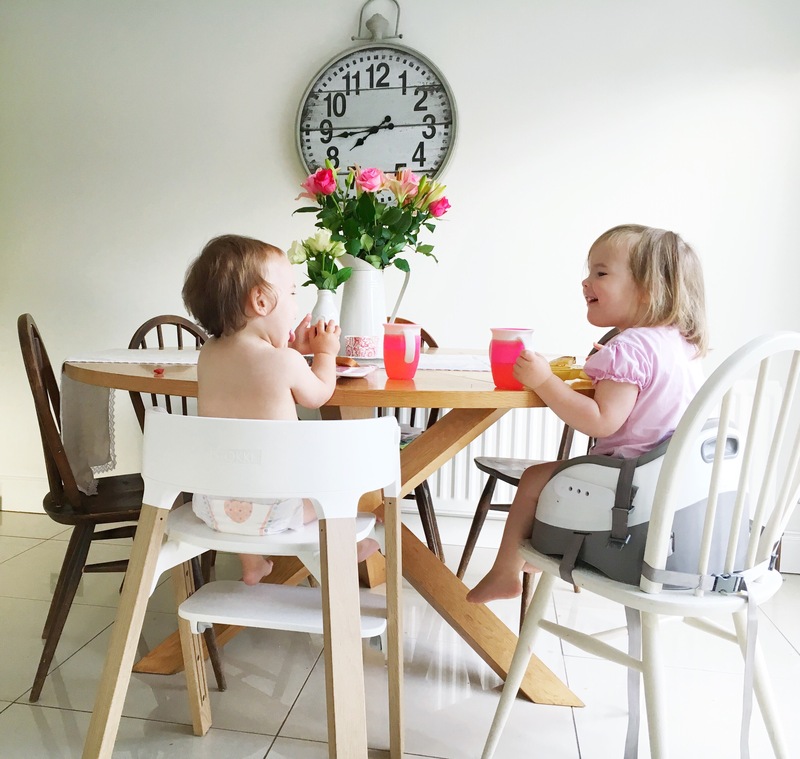 Stokke very kindly sent us this highchair for the purpose of this review but all opinions and love for the chair are entirely my own.